Stollen is “fruit bread” that typically lurks in the darker corners of supermarket bakery departments until Christmas, when it emerges like a glorious butterfly to take its rightful place front and center in the bakery section. 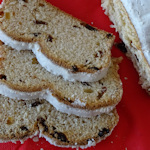 You can think of a Stollen as the love child of a fruit cake and a loaf of bread: it’s typically made from a yeasty dough, covered in icing sugar and replete with dried fruit soaked in rum. Stollen is now quite popular in the UK and USA, too, largely because it’s not too difficult to bake at home (we bake our own and bring them to friends as gifts). As with just about every baked product in central Europe, there are different varieties. At Christmas you often see Stollen with, for example, marzipan, poppy seeds or nuts, though it’s the dried fruit variety that is the classic version. Like you’d expect, you eat it in slices, often with tea or coffee, or as part of the Christmas bakery selection alongside Lebkuchen, Christmas biscuits and spekulatius. And how do you say stollen? At first glance, it seems an easy word to say in Austrian-flavoured German – “stoll” to rhyme with “doll” (British English) and an “en” like in “burden” (ditto). The “st” has a “shh” at the start though – “shhtollen”.